Following the failure of the Susan B. Anthony Dollar, there was an effort to revive the dollar with a new design. When the debate settled, Congress produced legislation to change the coin to have a golden color and a smooth edge to make sure it can be distinguishable from the quarter. After another debate, Sacagawea, the Shoshone guide of the Lewis and Clark expedition, was eventually chosen for the coin’s design. When the designs were reviewed and following a vote by the public, Treasury picked Glenna Goodacre’s design with the profile of Sacagawea in three-quarter view and her infant son, Jean Baptiste Charbonneau, carried on her back. Since there are no known images of Sacagawea, Goodacre searched for someone she could model her design on. Goodacre found Randy’L He-Dow Teton is a member of the Shoshone-Cree tribe to be the model. Teton was a student at the University of New Mexico majoring in art history and was working for the Institute of American Indian Arts Museum in Santa Fe when Goodacre visited looking for information about the Shoshone tribe. While talking with the museum’s curator, Goodacre was shown a picture of the curator’s daughter, Randy’L, and decided to work with her to create the Sacagawea design. Recently, Teton sat with Nate Eaton of EastIdahoNews.com for his series East Idaho Newsmakers. Although they cover other topics, most of the video is about Teton’s experience as being the model for Sacagawea. EastIdahoNews.com does not provide the ability to embed the video elsewhere on the web. 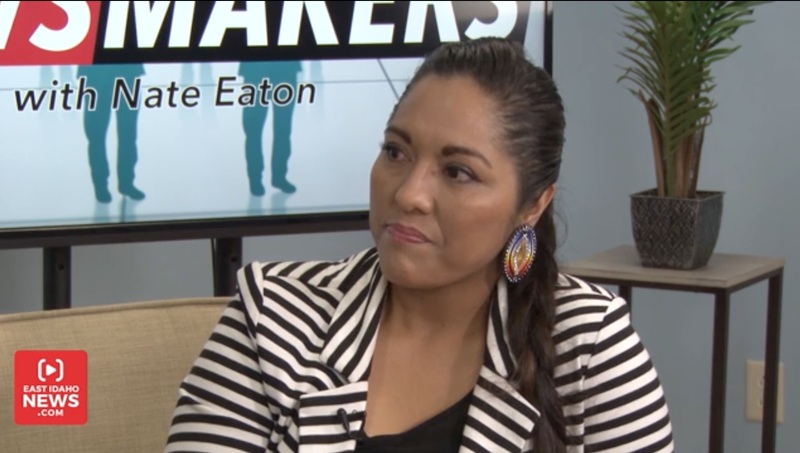 To watch the video and hear the story from Teton’s point of view you can visit the site: Newsmakers: The fascinating story of how this local woman ended up on the dollar gold coin.